Postpartum Hair Loss - What Causes It? What Can You Do About it? What Can You Do About Postpartum Hair Loss? Three types of postpartum hair loss: thyroiditis, telogen effluvium and alopecia areata. This page discusses all of them, and then suggests what you can do about it. Pregnancy - it’s a quite an ordeal isn’t it? Not only do you get morning sickness, put on loads of weight, change shape and suffer all sorts of aches and pains, but when it’s all over, you might suffer hair loss too! 3. Stress levels through the roof! More women today delay having children until they're much older. This increasing trend reflects the preference many women now have to concentrate on a career first and raising a family second. 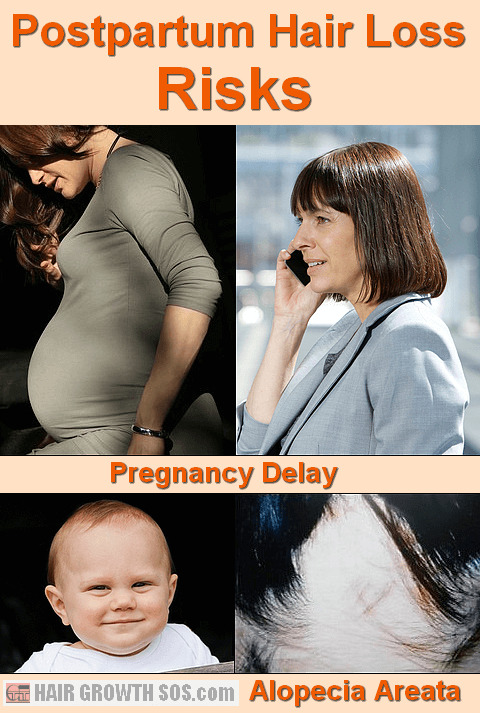 But, unfortunately, this delay can hinder the female body's ability to restore normal hormone balance following the upheaval of pregnancy and childbirth. This is basically because an older body is more likely to have a slower metabolism or inadequate hormone levels than a younger, healthier body. So what consequences can this have on your hair? Basically, during pregnancy female hormone levels rise, and this usually encourages hair to grow extremely well. But after pregnancy there’s a corresponding drop in female hormone levels. And this reduction can then cause hair loss to develop. Postpartum thyroiditis involves inflammation of the thyroid gland, and is thought to develop due to changes in the immune system during pregnancy. It affects approximately 10% of women some months after they've given birth, but is usually temporary and so, should be corrected naturally after about a year. The symptoms of postpartum thyroiditis can be quite confusing - they can include those of hyperthyroidism initially, followed by those of hypothyroidism (and the symptoms of both these disorders include hair loss). So to find out whether this could be the type of hair loss you have, take a look at the symptoms of both hyperthyroidism and hypothyroidism: Thyroid-related hair loss. Telogen effluvium usually causes gradual hair thinning and hair loss. And it can also be called "diffuse" hair loss because it involves a general thinning spread out across the whole scalp, rather than massive hair loss or baldness in a localized region. Women can develop telogen effluvium within the first five months after they’ve given birth. And the reason why is basically because their hormones have been thrown out of whack. Throughout a pregnancy, there’s a big rise in female hormone levels (estrogen and progesterone). And this causes the mother’s hair to grow exceptionally well. But, once the baby has been born, her hormone levels drop back down again, and this shock to the system can then have an adverse effect, causing telogen effluvium to develop. Any hair loss of this type should subside after about a year and a half. But, that’s a long time to have hair loss - you can lose a lot of hair in a year and a half! And it can last even longer if you also have androgenetic alopecia or previously had alopecia areata (see next section). Postpartum telogen effluvium can affect a lot of women - as many as 50%. And there can be multiple causes of telogen effluvium as well. You can learn about all of these by reading this telogen effluvium article. This is a very nasty type of hair loss – severe, rapid, localized hair loss that can develop into bald spots or patches within days. So if you’ve got alopecia areata, you would definitely know about it! This is an autoimmune disease. It can run in families and be stress-related. So, what with pregnancy and childbirth potentially being one of the most stressful events of your life, it’s hardly surprising that those women with a tendency towards this disease might experience it following a pregnancy. Similarly, if you’ve already had previous episodes of areata, your pregnancy might just be the trigger that causes a new flare-up of hair loss. Learn more about alopecia areata? The techniques which restored hair regrowth for me and so help overcome the hair loss I suffered (androgenetic alopecia) should help women with postpartum hair loss too. That’s because these techniques can stimulate the scalp follicles and so, should be able to get your hair growing normally again sooner than if you have no treatment at all. If you just sit and wait (and hope) that your hair will suddenly start growing again the way it used to, that might mean wishful thinking for months. And fretting about your hair loss will only make it worse! Learn about the techniques that saved my hair? Note: It’s important to be aware that my techniques are probably suitable for postpartum hair loss caused by telogen effluvium or a thyroid condition, but not for alopecia areata. Areata is an autoimmune disease currently without any known cure. So, unfortunately, my techniques are unlikely to be of any help for people with this disease.